My children have been very busy over the past month building structures from Tied 2 Teaching‘s STEM Activities, Full Year of Challenges with Close Reading. Today we’re going to share our review with you. 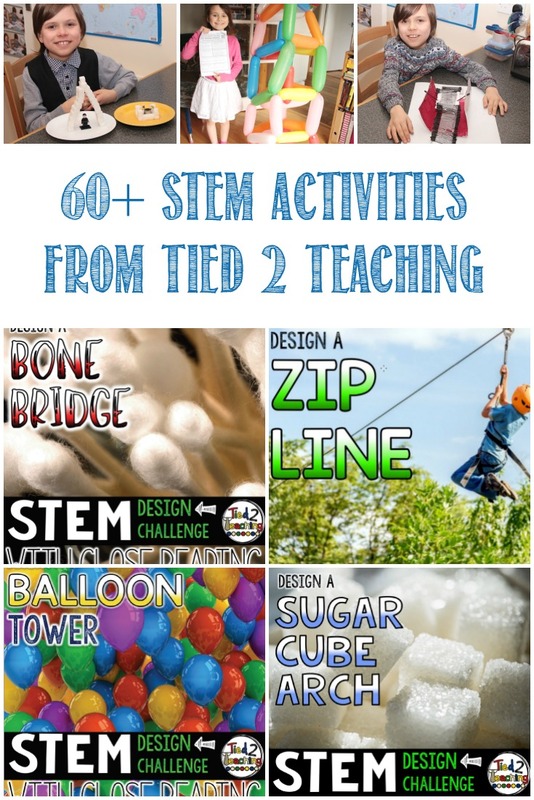 We received over 60 STEM activities in our PDF package, which arrived as a zip file. The children were a little overwhelmed trying to decide which ones they wanted to work on first. The activities are all presented as challenges, all of them creating something, most of them building structures akin to civil engineering. The Full Year of Challenges has activities themed to every month and many holidays, as well as dozens of projects that are suitable all year. I was surprised my children didn’t gravitate towards the many building bricks challenges. In addition, students can also design a doghouse, make a funky Christmas ornament, make a marshmallow snowman, create an upcycled bird feeder, build a log cabin, make a paper table, and so many more. All of the projects we viewed are set up with the same structure. There is a link to a close reading passage on another site, and after the kids finish reading it, they are asked to answer a page of questions about it. Often this topic isn’t directly associated with the structure’s form, but are interesting nonetheless. For example, with the Sugar Cube Arch Challenge, children learn about why too much sugar is a bad thing. 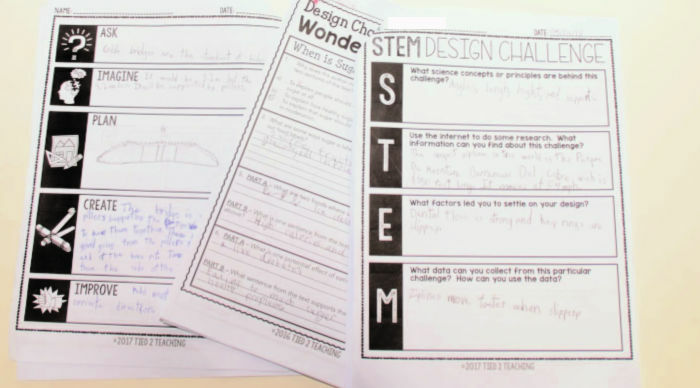 The Challenge criteria are provided; what the specific challenge is, what the design criteria are, the materials needed or suggested, and what a successful final outcome will resemble. Children are then encouraged to think about what they will make, and how. They write and/or diagram their plans using the pages provided, work on their structure, and then debrief, answering the questions on the pages in relation to what went well, what didn’t, and how their structure could be improved. Kallista (8) completed 2 STEM activities, and Tristan completed 3 (one was the same as Kallista’s). The first activity Kallista worked on was building the highest free-standing structure she could out of balloons. She used what we had and created a lovely tower out of elongated balloons rather than round balloons. Cross-braces and counter-balances were also applied. The only drawback was when a balloon popped and you could hear her frustrated growl throughout the house! Special thanks goes to Phil for his lung power to blow up all the balloons! Next, Kallista made an arch out of sugar cubes and icing. She thought this was fun, and even added a flower pot to for decoration! Tristan was a little more practical with his, but he also made a small additional structure to go along with the arch. Kallista’s icing ‘glue’ was thinner and took longer to dry. Her arch did break twice (but this was my fault when reaching over it into the cupboard). Tristan made his 2 cubes thick for extra strength, and thicker mortar. When it came time to clear the arches away after a week or more, they were both very stable and in fact were difficult to break apart and get off the plates. Success! Tristan’s first project was making a bone bridge. His close reading involved learning about the human skeleton, and I showed him some photos from the Sedlec Ossuary, in the Czeck Republic, where they have turned human bones into chandeliers, coats of arms, and other oddities. Tristan worked very hard on this using tissue paper for lava and painting the cotton buds black to represent scorched long bones. He even thought about cross-braces and support using towers/pilons below, too. His previous engineering course came in handy for this project. Then the zip line caught Tristan’s eye and he was really excited about it! He started gathering materials and measuring space up before he went to bed so he could get a jump on it in the morning. Their first challenge took them a long time to do, but once they got the hang of things, the following challenges took a lot less time for them, and were less stressful for me, too. There was more than one sheet to fill out in each challenge that were very similar, and let to some confusion. Perhaps a note in the procedures stating how they should be used would be helpful, such as if they are all needed, or if they are there in different formats but children need only do one, etc. In addition, I would have loved to have had an answer key. My children can be quite independent, which is great, but it meant that when they were working on a challenge alone, it meant that I then had to go and find and read the close reading passages to see if their answers were correct. If a teacher had a classroom working on several challenges, this can take up a lot of extra time. These STEM activities were quite good, and we liked the variety of them, there’s certain to be something to capture every interest. I was pleased that my son wanted to do a challenge that his little sister had already completed, rather than calling it a day. Overall, the challenges were good, and most use items that are already around the house or easy to source, which makes them more accessible. I think these activities would also be fun for grandparents and other caregivers to do with children, too. Although my children did the challenges individually, they called on each other when a little extra help was needed, and they encouraged each other along, which was great to see. I don’t think my children would go for a challenge a week, but perhaps we can build one into their schedule every 6-8 weeks to keep their minds and hands working together. Read more reviews about Tied 2 Teaching by the Homeschool Review Crew. You will find 70 honest reviews blogged and vlogged by the Crew. If you’d like to know more or would like to follow Tied 2 Teaching, you can connect with them through their website, Facebook, Pinterest, and Instagram.